Recently we have formed an Archaeobotanical research team that parallels the Geoarchaeological team discussed in an earlier post, “Geoarchs in Action”. The Archaeobotanical team leader Dr. Phil Dering has been joined by Dr. Leslie Bush and Dr. Kevin Hanselka as our collaborating experts in archaeobotany, meaning that they specialize in the analysis and identification of macrobotanical remains (plant parts visible to the naked eye) recovered in archaeological excavations. 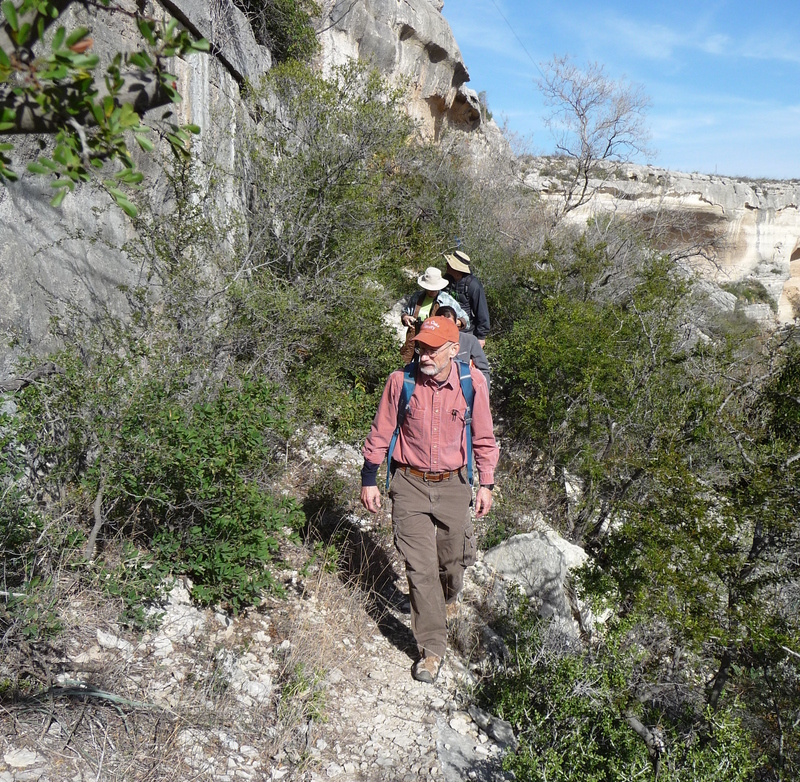 Phil Dering leads the Archaeobotanical team through Eagle Nest Canyon. Blog followers were introduced to Phil in the recent post, “Winter in the Canyon”. 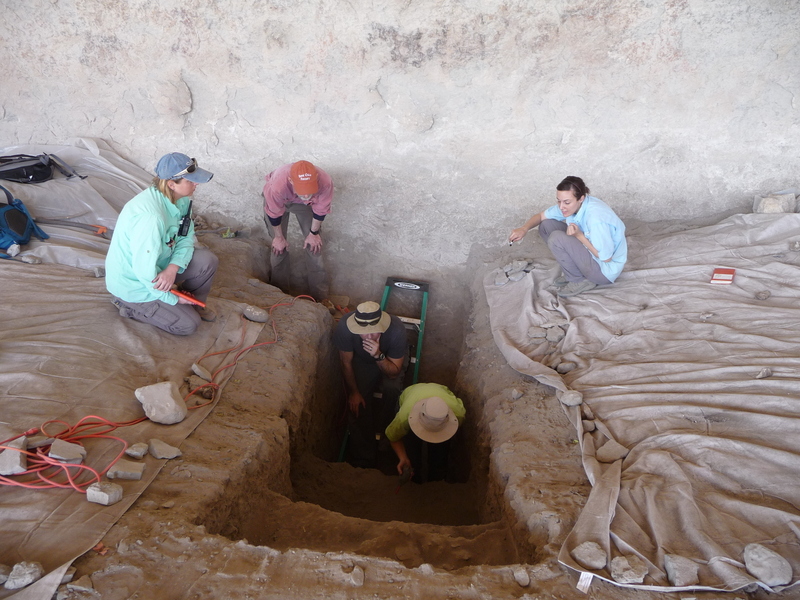 Phil and Steve have dreamed and plotted about excavating and sampling dry rockshelters in the Lower Pecos for years. Now that is finally happening, we are generating much more plant work than Phil can handle on his own, so he has recruited Kevin and Leslie to join him. While Phil has been looking at macrobot samples from Hinds Cave and other Lower Pecos shelters for over three decades, he realizes that fresh eyes will bring new strengths and ideas to our collaborative endeavor. Leslie Bush, who earned her Ph.D. at Indiana University Bloomington, runs her own macrobotanical consultation service based in Austin and she analyzes samples from many CRM (cultural resource management) projects in Texas. She is also quite active in the Texas Archeological Society and the Travis County Archeological Society. Working with Lower Pecos samples will allow Leslie to expand her plant knowledge westward from the Eastern Woodlands and the eastern two-thirds of Texas where she has done most of her previous work. Kevin, who earned his Ph.D. at Washington University in St Louis, is a bit more familiar with desert plants. His dissertation was on plant use in Southwestern Tamaulipas and he has also worked in Chihuahua with Dr. Bob Hard of UTSA. Kevin now works as an archaeologist for TxDOT and he jumped at the chance to become involved with ENC plant remains and put his training to use. How does that saying go, three heads are better than one? 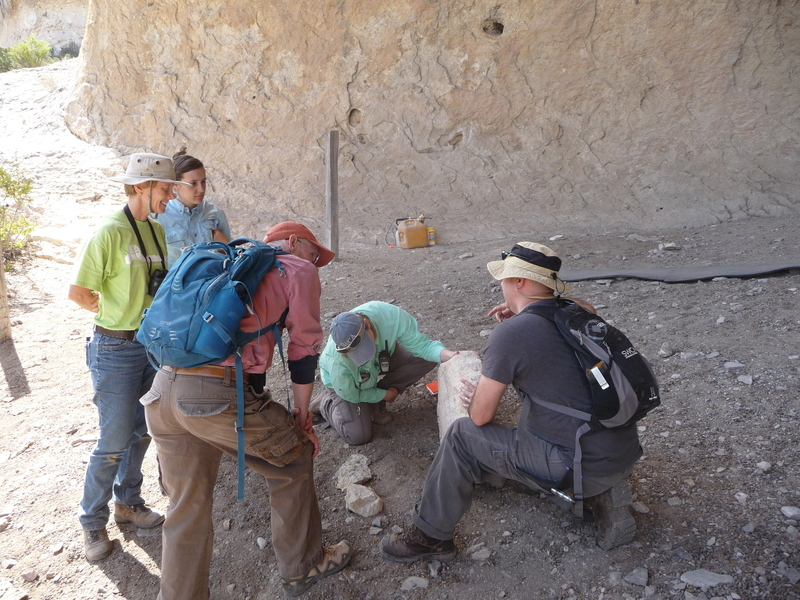 I (Brooke) was fortunate enough to tag along with the archaeobotanists on their recent visit to Eagle Nest Canyon as they formulated a game plan for dividing and conquering the wealth of plant remains that we are recovering from the ENC rockshelters. From their conversations I learned that archaeobotany is even more intensive than I had thought. Plant species vary considerably across the Lonestar State, so becoming familiar with the types found in different regions takes lots of time and a trained eye. During their visit, Kevin and Leslie collected samples of flora commonly found in the Lower Pecos Canyonlands to improve the comparative collections in their labs back in Austin. I hope to help Phil collect more comparative samples this spring, as various plants begin to flower and fruit. In fact, I hope to be able to help all three of our plant experts as the project unfolds and learn whether archaeobotany might be a viable career route for me. As mentioned in earlier posts, the mantra for our expedition (and more specifically our excavation methods within Eagle Cave) has become “Low Impact-High Resolution,” meaning that we are attempting to learn as much as possible from the site while simultaneously minimizing our impact upon the remaining intact deposits within the shelter. To do this we are exposing stratigraphic profiles by digging into disturbed deposits and cutting back until we encounter intact layering. We are carefully documenting and sampling the intact layers as future posts will detail. Due to the modest size of our sampling areas, much of what we will learn from Eagle Cave will come from intensive analyses of matrix samples from the many strats (stratigraphic layers) we are encountering. Over the course of our expedition, therefore, we will be visited by collaborating experts on everything from geology to plants to bugs to bones in an effort to learn as much as possible from our strats. Brooke describes the layers she has been exposing in PS 2 (Profile Section 2) at the back of Eagle Cave. The Witte Museum trenched all along this wall in 1936. Leslie and Kevin examine the first intact layers we have encountered in PS2. The Three-headed Archaeobot visit took place the same day as the Archaeolympics and so while everybody else played with atlatls and fire drills, we (Brooke, Steve, and Tina Nielsen) got to see the Canyon through the eyes of the plant experts. We visited each of the three rockshelters where ASWT archaeologists have been working, Skiles Shelter, Kelley Cave, and Eagle Cave. At each we looked at the excavation exposures and Steve explained our working ideas about the stratigraphy and we talked about the plant remains we have recovered. Phil, Leslie and Kevin soon lapsed into rapid-fire plant speak using the specialized terms like “bast,” as Brooke and Tina struggled to take notes and Steve kept nodding, giving the misleading impression that he understood all they were saying. But as the archaeobotanists talked the talk, we lurkers began to appreciate what they were after and what they would need from us to make it happen. In addition to being knowledgeable about the plant species across the landscape, archaeobotanists must also be experts in plant anatomy, considering that most of plant remains archaeologists find in the ground are tiny fragments, many of which are burned. One of the difficult tasks that our experts will face with the ENC samples is identifying the materials in cordage/basketry/sandals, because these plant fibers have been pounded so that the epidermis is removed and only the bast (the insides) remains. But while it is very difficult and sometimes impossible to identify the plant species represented by processed fiber, we think our sites have the well-preserved evidence of full behavioral chains from plant collecting to baking to food consumption to fiber production to weaving and plaiting to finished object to final discard. Documenting and understanding these interwoven sequences of behaviors is one of our goals. The tons upon tons of burned rocks spilling out of the mouths of all of the ENC rockshelters (except Bonfire) show that baking desert succulents like agave lechuguilla and sotol was one of the most common activities in the Canyon. Kevin (far right) points out scars on the bottom side of this small boulder suggest the deep mortar hole that goes all the way through it was quite intentionally created this way. Perhaps the open-ended mortar hole served as a “hopper” below which a basket might have been place to catch the pulverized food remains. He has seen similar “artifacts” in Chihuahua. Incidentally, we think J. Charles Kelley described this very rock in May 1932 when he and E. B. Sayles dug small tests in Eagle Cave. At most archaeological sites archaeobotanical analysis involves identifying charred plant remains—wood charcoal and sometimes burned nuts and seeds—because that is all that is left. Some charred “macrobotanical” remains can be identified with the unaided eye, but most specimens require careful microscopic examination and comparison with reference samples from known plants. At Kelley and Eagle Caves, however, many of the plant remains have preserved in a desiccated state due to the dry conditions of the protected rockshelters. We are finding many kinds of uncharred leafs, flowers, seeds, nuts, fruits, branches, and so on, as well as massive amounts of charred remains. For our experts, looking at uncharred floral remains under a microscope will be a welcome change from what they see most of the time. Identifying these desiccated plant parts requires a more complete comparative collection that is needed when all you have is charred wood fragments. 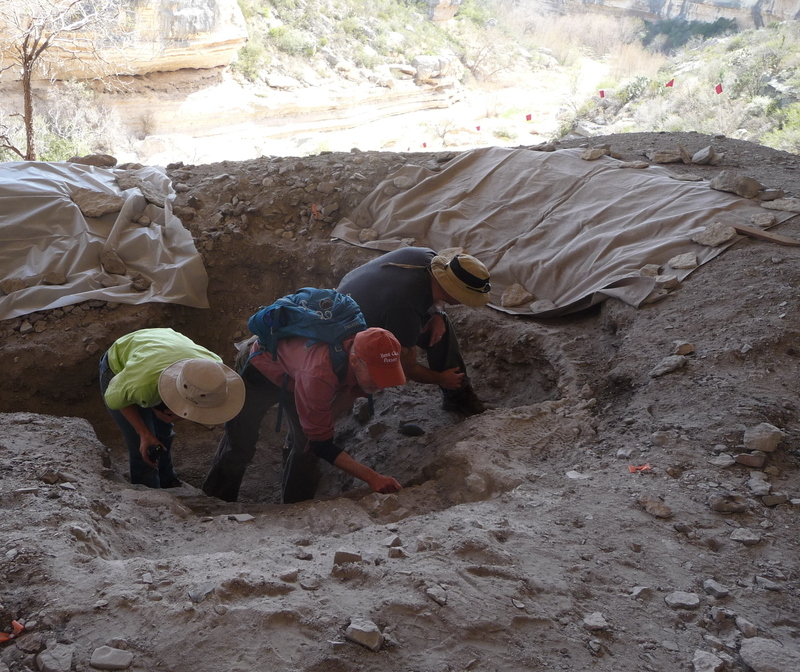 Three archaeobotanists examine newly exposed layers at Eagle Cave. From left to right, Leslie, Phil, and Kevin. The most shocking part? The archaeobotanists will only need a liter bag of matrix from each layer we sample to make inferences about all of that! How is that for low-impact, high resolution? This entry was posted in Paleoethnobotany, Spring ENC 2014 Posts. Bookmark the permalink. Wonderful descriptions of your work–and that of others.